Keyboards rhythm guitar, bass guitar, backing vocals. Steve aka Mr Piano... www.mrpiano.co.uk has been involved in the local music scene since the age of 7 when he played trumpet in his junior school orchestra. Since then he has played in the county youth orchestra, brass bands school and church choirs having toured Europe several times, he has also been called upon to provide the accompaniment for local rock opera performances. 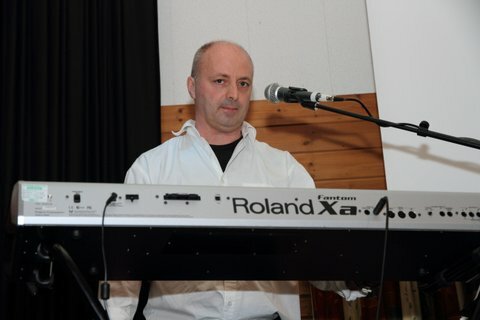 Steve has played keyboard and guitar in several groups before joining forces with Darren Taylor to form a successful local rock covers band which later received a small change in line up to become ... “The Commitment Brothers”. Highlights so far :- playing at the “Cavern Club” Liverpool Fav song in show :- show me Fav musicians include :- Jools Holland and Rick Wright Gear :- Roland Fantom XA (the puppies nuts), Yamaha mo x 6, Yamaha gw33 guitar effects pedalboard, Les Paul Gibson copy, fender 6 string acoustic, voice - own till I can borrow a better one.